So, how precisely can you calculate your flight time and fuel burn for flights of 210 nautical miles and 297 nm—while zigzagging over generally unfamiliar terrain, seeking to identify features of sometimes-obscure checkpoints below? Do you think you could fly such a route, hit your computed flight time for each leg within a few seconds, while burning within a fraction of a gallon of your estimated fuel? Allison Verbil, daughter of rally pilot Chris Verbil, drops the starting flag at Hayward Executive Airport for Dan VanDusen and Barney Smith, competing in a Beech Bonanza. They placed eighth in the 2017 Hayward Air Rally. Photograph by Carl La Rue. This map depicts the tracks flown by the 13 aircraft participating in the 2017 Hayward Air Rally, as determined by on-board GPS trackers. Pilots can choose their own routes between checkpoints, because they&#226;re competing against their own flight planning&#226;not the clock. Some choose longer routes following roads, to simplify navigation. Many aircraft circle or take other delaying actions on the final segment of each leg to use extra time, if they&#226;re flying ahead of the time they planned. Clockwise from right, Kim Purcell and Rob Kirkpatrick fly their Beechcraft Bonanza H35 as Race 8. Chris Verbil stands beside Race 1, his Socata Trinidad TC. At the Redding fuel stop, the meter reading is revealed to Duane McCune (white shirt) and Tim Huckabay (green shirt), competing in a Cessna 172. Purcell shares a laugh with Michael Saboff, co-pilot for last year&#226;s winning team, when Race 24 arrived to a decorated parking space in Hayward before the rally. The rally is father/daughter time for Keira and Thomas Engdahl. Photo by Carl La Rue. The afternoon before the rally, Mike Citro, right, and co-pilot Scott Allaway plan their route. Some racers level their airplanes with shims before fueling, in an effort to increase accuracy. Kim Purcell and Rob Kirkpatrick bank to help identify a checkpoint. This bridge under construction north of Redding was a checkpoint, chosen because online aerial images might not reflect recent changes to the site. The Hayward Air Rally is a not-for-profit 501(c)(3) charitable organization, and for several years has been providing scholarships—covering tuition and airfare—for young people to attend EAA’s week-long Air Academy summer camp in Oshkosh. The 2017 recipients are Avery Apple, of Redding, California, a high-school sophomore, and Jordan Luiz of Cottonwood, California, a junior. 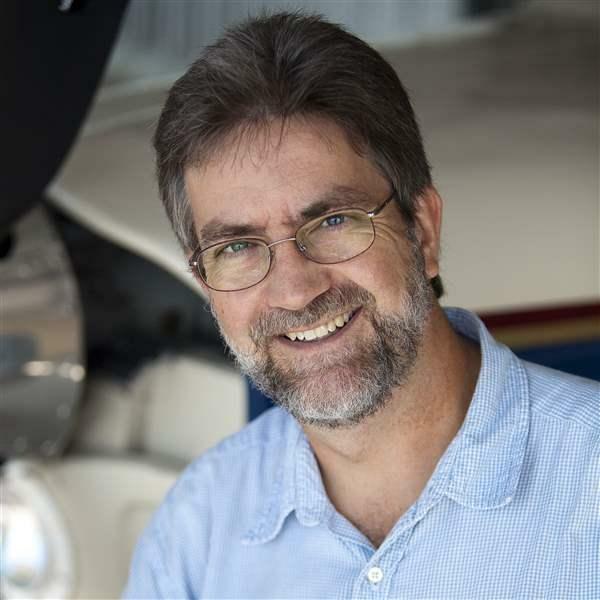 “As part of our nonprofit mission, it is important to help seed the next generation of aerospace industry professionals, aircraft pilots, and aviation enthusiasts,” said racer Chris Verbil, a member of the Hayward Air Rally Committee. Full results of the 2017 rally are available online. The 2018 Hayward Air Rally is tentatively scheduled for June 21-24; check the website for updates. That’s exactly what 13 teams—some with two pilots, others with one flying solo—sought to do June 22 through 25, 2017, as part of the Hayward Air Rally. The teams journeyed from Hayward, California, to Reno/Stead Airport in Nevada by way of Redding, California. This is not a race; crews fly against their planned time and fuel consumption. Every second, and fraction of a gallon, higher or lower than planned will earn penalty points. Traditional flight planning and pilotage skills are emphasized and scoring is like golf—the lowest number wins. It also may be the only time you hear pilots complain when they burned less fuel than they expected during a flight. How close do pilots come? This year a team hit one of its leg times exactly; three missed one by one second; and two others missed one by three seconds. The majority of legs were flown within 30 seconds of their planned times, and fuel-calculation accuracy was nearly as impressive—the best leg, 0.11 gallons off. But the reward is in completion, and it’s clear that even the higher-scoring teams are having a good time. Neale said the rally, now entering its fifty-fourth year, grew from a personal challenge between pilots who were also Hayward city officials, and is the longest continually held proficiency flying event in the United States. Climbing through 3,000 feet over Livermore, California, on rally day, the outside temperature jumps from 65 degrees Fahrenheit to 80 in the Beechcraft Bonanza H35 flown by Kim Purcell and her husband, Rob Kirkpatrick. “Now we’re getting that valley flow. Our new course is going to be 057 degrees—I’ll tell you when. We’re behind by two minutes, which we already knew,” he says. “And I have to listen,” Purcell laughs. On a hillside near Rio Vista, wind turbines spin lazily below as a checkpoint approaches. “I’m going to put it off your side,” Purcell tells Kirkpatrick. A steep bank reveals an ag strip with no runway markings. (Flying directly over a checkpoint can make it impossible to identify.) Although they carry a GPS tracker, Kirkpatrick photographs the strip with his cellphone, as proof it was located. The team is navigating in the traditional or analog class; VORs and NDBs are allowed but GPS is not. “Maxwell [VOR] is out of service,” Kirkpatrick observes. “I’m pulling a radial off of Williams.” There’s intermittent chatter on the common air-to-air frequency rally pilots monitor, and one offers ADS-B groundspeeds for several aircraft. There’s also discussion as to whether this is useful information or overload. Nearing the first leg’s end, the team calculates they’re two minutes ahead of schedule—and commences a two-minute left turn west of the Red Bluff VOR. Then, suddenly, they’re behind schedule. Purcell accelerates the Bonanza and dives for the timing line. They finish the leg 81 seconds behind their projection, and place fifth overall. Departing the Redding fuel stop, Chris Verbil has calculated that the second leg will take 2:02:14 to fly in his Socata Trinidad TC. It’s 68 degrees Fahrenheit at 6,500 feet—considerably warmer than standard, validating the decision to launch aircraft an hour earlier than normal—as snowcapped Mount Shasta slides past his left wing. A longtime racer, Verbil now competes in the digital class, accepting additional penalty points in exchange for the use of technology (timing points for digital contestants are tripled, and fuel points are doubled). “I used to stay up half the night planning,” he said. “GPS and tablets make this wildly easier, but you can still get wildly lost and run out of gas. We’ve got too many people doing that—people have gotten remarkably good at pushing the Direct To button.” Flying in the digital class is not as easy as you’d think, he’s quick to add. The winds aloft, forecast as light and variable, shift again. “Someone’s lying to me,” he grumbles about the forecast. Verbil’s groundspeed is 7 knots slower than expected, but he’s running slightly early. A few checkpoints later, groundspeed is 10 knots faster than planned. “You’ve got to catch that right away. This late in the course, you don’t have much chance to correct.” Then Virbil’s iPad shows a bright red temperature warning and shuts off. “Now I’m hosed,” he says. Eight miles from the segment’s timing line, he realizes he’s 18 seconds early. He pulls off some power, and enriches the mixture to keep the turbocharged Lycoming TIO-540 cool. Later, he learns he hit his time exactly, the only pilot to do so this year—although the day sees 10 segment times within 10 seconds of plan. “It’s amazing when it comes together, but the fuel is the hard part,” Virbil says. He burns 1.4 gallons less than anticipated and is assessed 218 fuel points for the segment, securing fourth place for the day. Keira Engdahl may only be 12 years old, but she’s a seasoned rally crewmember. Tim Ronan and co-pilot Michael Saboff got involved in the rally through their club, Seagull Flying Club at San Jose International. Saboff learned about the rally from another club member, Hal Beers, and started competing with him in 2005. When Beers stepped aside, Ronan jumped into the left seat of the club’s Beech Bonanza A36 in 2013. “The first year that I got involved, we were in the analog class,” Ronan said. GPS navigation displays were covered, and they flew using pilotage. A glass-cockpit upgrade to the Bonanza, including installation of a primary flight display, pushed them into the digital class—and reduced their planning time the night before, from three or four hours to about an hour, he added. “One of the equalizers in the rally is the checkpoints. For planning purposes, it’s pretty straightforward. You still have to get over the mark and answer the questions [identifying them]. But using the GPS, you can be too accurate—if you fly directly over the top, you can miss the airport,” Ronan said. “Fuel is still evolving in our formula. It seems there’s something new each year that we haven’t figured out,” Ronan noted. They won the event for the second consecutive year and will compete next year in the Masters Class, a separate category for pilots who have won first place twice. Brian Dal Porto placed last this year, flying solo in his two-place, open-cockpit Marquart Charger biplane—recording an average groundspeed of just 77.5 knots. (Dal Porto had to make an extra fuel stop on the final, 297-nm leg to Reno.) His only previous rally was the fiftieth anniversary event in 2014, a three-day journey to Oshkosh. “For years I’d wanted to do it, and just couldn’t make it work,” he said. The aerobatic airplane always requires a hand on the stick. “You’re out in the sun and the wind all the time—it’s like riding a motorcycle,” said Dal Porto, who navigates using an iPad. “I’ve lost three charts trying to refold them.” There’s no place in the cramped cockpit for a water bottle, he added. Although his airplane isn’t ideally suited to the rally—or, perhaps, because of that—Dal Porto enjoys the challenge, and said he plans to fly it again next year. “There are a lot of techniques that people have developed over 50 years,” Neale noted. For example, he said, some people will plan the flight and add a few minutes—then they’ll circle before crossing the timing line to run off extra time that wasn’t needed. Others will vary airspeed as they near the timing line, but power changes can have a negative effect on the fuel score. Sometimes the unexpected happens. A Cessna 182RG could not launch for the rally because of a failed magneto, but its crew hitched a ride with Neale, who didn’t compete. At the Redding fuel stop Mike Citro, flying a Piper Cherokee as Race #5, lost co-pilot Scott Allaway when he was called home by his pregnant wife—so pilot Rod Fite, whose Cessna was grounded with the bad mag, became Citro’s co-pilot for the second leg. And Neale flew Allaway back to Hayward just in time for the birth of his son, Nathan.